It knows where you live. It knows what car you drive. It knows who you’re meeting with today and how much sugar you take in your coffee. (At least it will, after the next software update.) This is the Edge, and it’s quite possibly the smartest office space ever constructed. 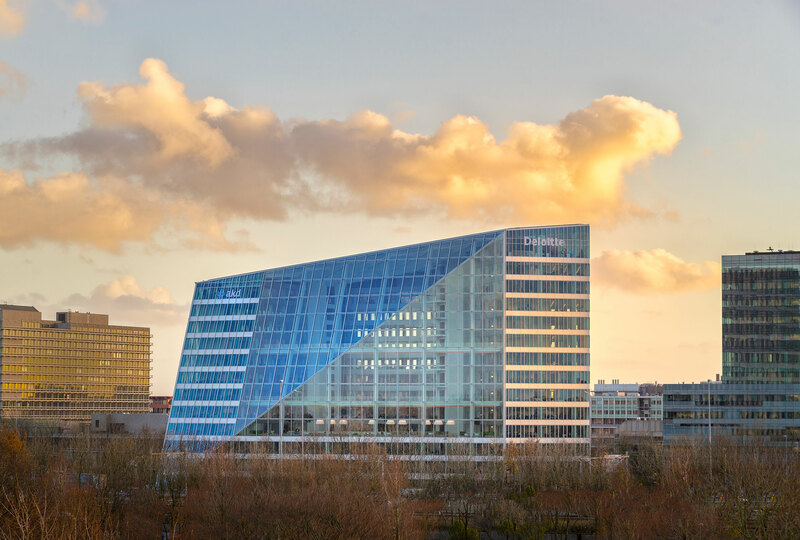 A day at the Edge in Amsterdam starts with a smartphone app developed with the building’s main tenant, consulting firm Deloitte. From the minute you wake up, you’re connected. The app checks your schedule, and the building recognizes your car when you arrive and directs you to a parking spot. Then the app finds you a desk. Because at the Edge, you don’t have one. No one does. Workspaces are based on your schedule: sitting desk, standing desk, work booth, meeting room, balcony seat, or “concentration room.” Wherever you go, the app knows your preferences for light and temperature, and it tweaks the environment accordingly. The Edge is also the ­greenest building in the world, according to British rating agency BREEAM, which gave it the highest ­sustainability score ever awarded: 98.4 percent. The Dutch have a phrase for all of this: het nieuwe werken, or roughly, the new way of working. It’s about using information technology to shape both the way we work and the spaces in which we do it. It’s about resource efficiency in the traditional sense—the solar panels create more electricity than the building uses—but it’s also about the best use of the humans. The building of the future necessitated invention. Several stand out. The super-efficient LED panels, made by Philips specifically for the Edge, require such a trickle of electricity they can be powered using the same cables that carry data for the Internet. The panels are also packed with sensors—motion, light, temperature, humidity, infrared—creating a “digital ceiling” that wires the building like synapses in a brain. All told, the Edge is packed with some 28,000 sensors. The atrium is the gravitational center of the Edge’s solar system. Mesh panels between each floor let stale office air spill into open space, where it rises and is exhaled through the roof, creating a loop of natural ventilation. Slight heat variations and air currents make it feel like the outdoors. Even on a stormy day, the building remains opalescent with natural light and angles of glass. 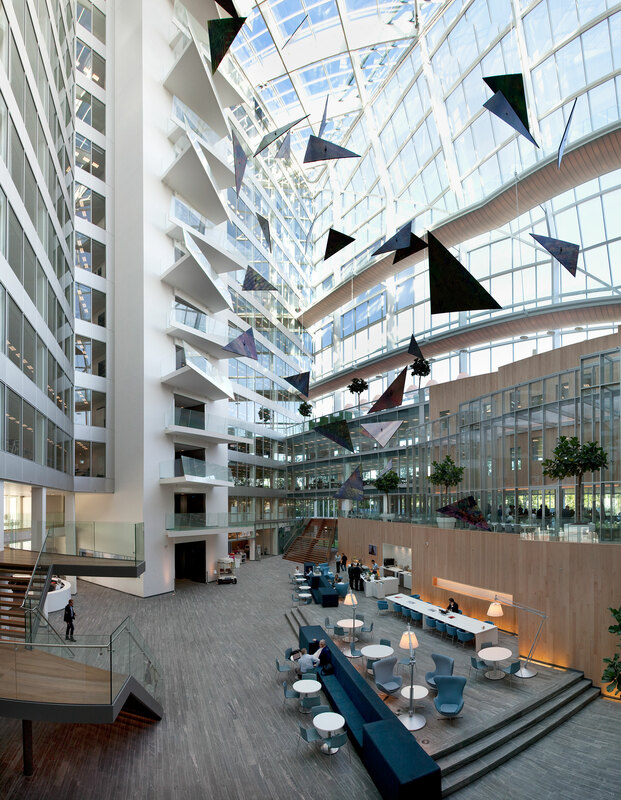 The atrium and its iconic slanted roof, which looks from the outside as if a wedge has been sliced off the building, floods the workspaces with daylight and provides a sound buffer from the adjacent highway and train tracks. Every workspace is within 7 meters (23 feet) of a window. About 2,500 Deloitte workers share 1,000 desks. 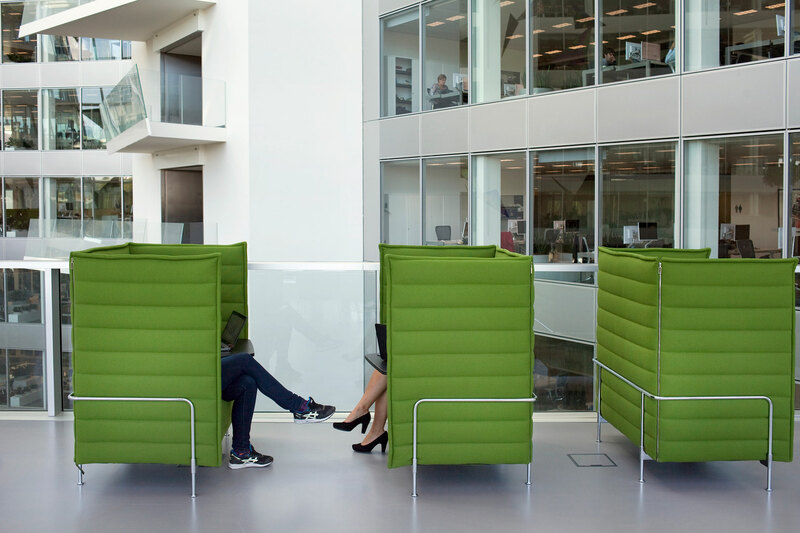 The concept is called hot desking, and it’s supposed to encourage new relationships, chance interactions, and, just as important, efficient use of space. Desks are only used when they’re needed. Some tiny rooms at the Edge contain just a lounge chair and a lamp (no desk)—perfect for a phone call. There are also game rooms and coffee bars with espresso machines that remember how you like your coffee. Massive flatscreens around every corner can be synced wirelessly with any phone or laptop. Since workers at the Edge don’t have assigned desks, lockers serve as home base for the day. Find a locker with a green light, flash your badge, and it’s yours. Employees are discouraged from keeping a single locker for days or weeks, because part of the het nieuwe werken philosophy is to break people away from their fixed locations and rigid ways of thinking. Deloitte is collecting gigabytes of data on how the Edge and its employees interact. 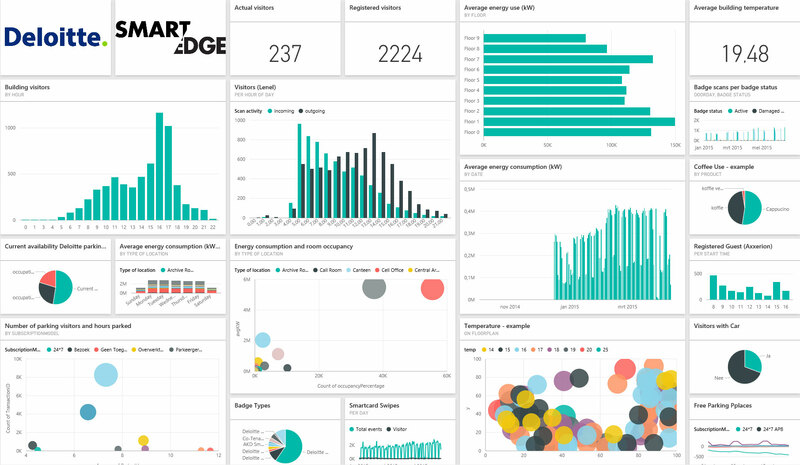 Central dashboards track everything from energy use to when the coffee machines need to be refilled. On days when fewer employees are expected, an entire section might even be shut down, cutting the costs of heating, cooling, lighting, and cleaning. Deloitte’s general philosophy with the Edge was that anything with a return on ­investment of less than 10 years is worth a try. The digital ceiling was one of the most expensive innovations; Deloitte wouldn’t disclose the cost, but Erik Ubels, chief information officer for Deloitte in the Netherlands, says it will take 8.3 years to earn it back. The smartphone is your passport to the Edge. Use it to find your colleagues, adjust the heating, or manage your gym routine. You can even order up a dinner recipe, and a bag of fresh ingredients will await you when the workday is over. All desks are equipped with built-in wireless chargers so your phone can keep itself charged. When you arrive at the Edge, garage entry is automated. A camera snaps a photo of your license plate, matches it with your employment record, and raises the gate. Even the garage uses sensor-equipped LED lights, which brighten as you approach and dim as you leave. It’s the Netherlands, so a separate garage for bicycles and free chargers for electric vehicles aren’t surprising. In Amsterdam, even the airport taxis are Teslas. Don’t worry, your boss can’t access personal data from the Edge’s sensors and has no idea how many meetings you’ve missed this year. To be sensitive of privacy concerns, Deloitte surveyed employees before it installed the license plate scanner. The vast majority of respondents thought it was fine, as long as it made work life easier. The Edge is wired with a vast network of two different kinds of tubes: one that holds data (ethernet cables) and another that holds water. Behind each ceiling tile is a massive coil of thin blue piping that delivers water to and from the building’s subterranean water storage for radiant heating and cooling. During summer months, the building pumps warm water more than 400 feet deep in the aquifer beneath the building, where it sits, insulated, until winter, when it’s sucked back out for heating. The system developed for the Edge is the most efficient aquifer thermal energy storage in the world, according to Robert van Alphen, OVG’s project manager for the Edge. The southern wall is a checkerboard of solar panels and windows. Thick load-bearing concrete helps regulate heat, and deeply recessed windows reduce the need for shades, despite direct exposure to the sun. The roof is also covered with panels. 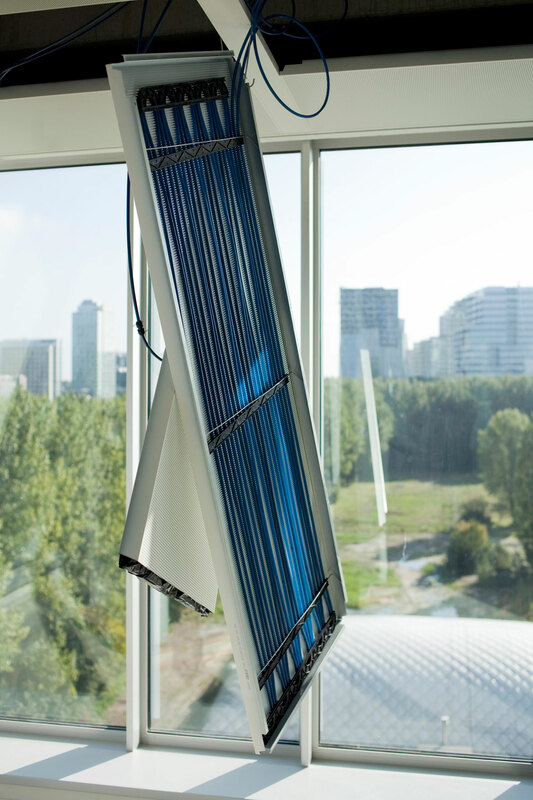 The ​Edge uses ​7​0 percent less electricity than ​the typical office building​, but it wasn’t until OVG installed panels on the rooftops of some neighboring university buildings that the Edge was able to boast that it produces more energy than it consumes. Is It Hot, or Just Me? Sensors in the LED light panels report detailed temperature and humidity readings across a floor (above). A Deloitte survey found that while fewer than a quarter of employees actively use the app’s thermostat features, three-quarters say they love it. Maybe that’s because precision controls eliminate the problem of natural hot and cold spots, often found near windows. A coming app upgrade will boost efficiency further by suggesting desk locations to employees based on their temperature preferences and meeting locations throughout the day. A massive concrete tub in the back of the parking garage gathers the rainwater used to flush the building’s toilets and water the gardens. It’s a loud room on a rainy day. The water rushes down from collection systems on the roof and outdoor balcony. This little robot comes out at night to patrol the grounds. If an alarm goes off, the camera-­equipped automaton can identify the culprit or let security know it was a false alarm. It cruises around automatically like a Roomba or can be commandeered by remote control. Deloitte’s Erik Ubels says he noticed similar robots in shipyards, tracked down the manufacturer, and asked if they could be modified for office security. 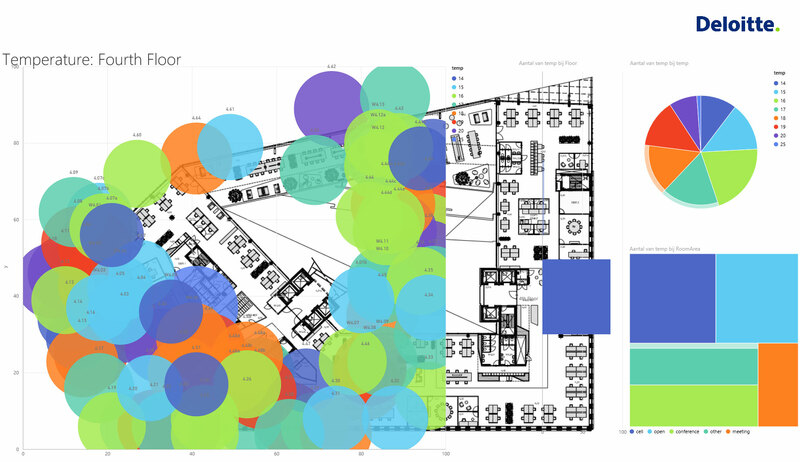 For smarter cleaning, activity is tracked by sensors built into light panels, so at the end of the day, the people and robots (above right) responsible for cleaning can focus on the areas that have been used most heavily that day. The on-site gym encourages employees to break for a midday workout. Flash your phone at the check-in station and the gym’s app automatically tracks your progress. Some of the ­exercise stations here will actually harness the energy from your workout, sending hard-earned watts back to the grid—as if you didn’t already feel like a hamster in a wheel. The Edge watches you in the bathroom, too (but not in a creepy way). A normal-looking towel dispenser provides a spool of cloth for hand-drying. Unlike a typical hand dryer, though, this one is connected to the Internet. It lets the cleaning staff know when a busy bathroom is probably ready for a cleanup. Birds, bats, bees, and bugs. These are the building’s neighbors on the north-facing terrace. OVG worked with Amsterdam officials to establish a continuous path of vegetation that supports beneficial insects throughout the city. Birdhouses and bat boxes are tucked discreetly into the landscaping. These pockmarked towers support various species of solitary bees, which buzz about the flowers on the public terrace.